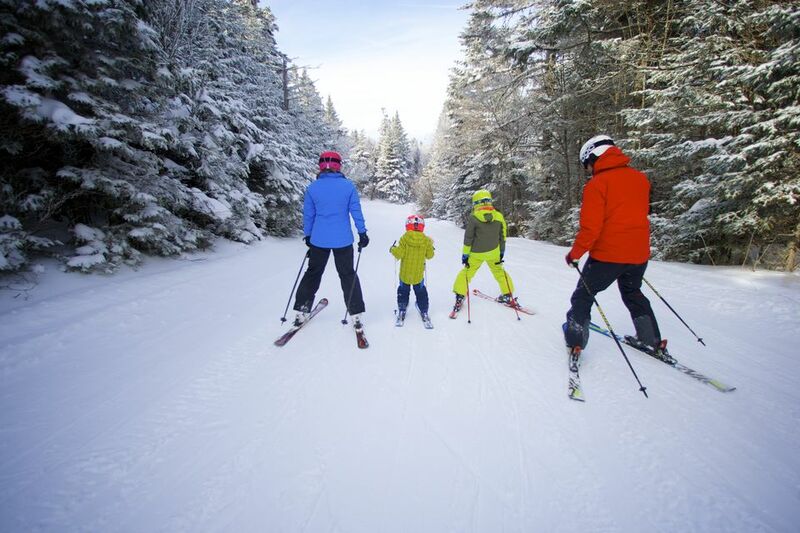 Okemo Mountain Resort in Ludlow, Vermont, is often awarded for snow-quality, grooming, its family-friendly atmosphere, and children’s learning programs. It is a two-hour drive from Albany, three from Boston, and about four from Montreal. The annual snowfall is about 199 inches a year. Base elevation of the resort is 1,134 feet and peak is 3,344 feet. There are five distinct alpine areas at the resort: Jackson Gore Peak, Solitude Peak, South Face, Glades Peak, and South Ridge. Okemo's 121 trails and glades of varying difficulty are serviced by 20 lifts (one high-speed six-pack bubble chair with heated seats, one high-speed bubble quad, eight additional quad chairs–four of them high-speed, three triple chairs and seven surface lifts). Okemo Ski Resort has 667 skiable acres; 2,200-foot vertical drop (highest in Southern Vermont); 32% beginner; 37% intermediate; 31% expert/advanced. Along with Okemo’s trail system, there are many creative terrain parks at the resort: Okemo Superpipe, The Zone, Tomahawk Park, Hot Dog Hill Terrain Park (introductory), OMS Crazy Train Progression Park, Robbins' Nest, Broken Arrow, NASTAR Race Arena, and Bounder Park, near the snowtubing area. Advanced: Black diamond trails on Main Face are Black Out, Broken Arrow, Challenger, Defiance, Fast Lane, Ledges, Lower Sel’s, Nor’easter, Searle’s Way, Sel’s Choice, Side Kick, Triplesec, Turkey Shoot, Upper Chief, Upper Fall Line, Upper World Cup, and Wardance. On Jackson Gore Peak are Eclipse, Quantum Leap, Upper Limelight, Vortex, and White Lightning. Southface has Blind Faith, Punch Line, Stump Jumper, Upper Wild Thing, and Wild Thing. Exhibition, The Plunge, and The Shadows are on Solitude. The double-black diamond trails on Jackson Gore Peak are Big Bang, Black Hole, Rolling Thunder, and Supernova and on Southface are Double Diamond, Forrest Bump, Loose Spruce, and Outrage. Intermediate: On Main Face, the blue square trails are Beeline, Chute, Countdown, Cutter’s Folly, Double Dipper, Drop Off, Everglade, French Connection, Jolly Green Giant, Link, Lower Chief, Lower Fall Line, Lower Tomahawk, Lower World Cup, Ridge Runner, Route 103, Rum Run, Sapphire, Scooter, Sprout, The Narrows, Timberline, Upper Arrow, Upper Tomahawk, Whispering Pines, and Whistler. Blue Moon, Lower Limelight, and Tuckered Out are on Jackson Gore. Southface has Catnap, Moment’s Rest, Moon Dog, Off the Rim, Rimrock, and Sprint. Solitude has Boomerang, Express Lane, Heaven’s Gate, Line Drive, Moonshadow, Screamin’ Demon, Side Out, Sidewinder, and Tree Dancer. Beginner: Beginner slopes are scattered in a few specific areas at Okemo. South Ridge is an area with beginners trails only: Bull Run, Fairway, Galaxy Bowl, Kettle Brook Trail, Ledgewood Trail, Lift Line, Open Slope, Robbins’ Nest, Ski School Slope, and Snowtrak. On the Main Face, beginner trails are Buckhorn, Easy Rider, Easy Street, Home Stretch, Lower Arrow, Lower Mountain Road, Mountain Road, Sachem, Switchback, Upper Mountain Road, and Zip. Mountain Road is the longest trail at the resort at 4.5 miles long. At Jackson Gore, beginners can ski Bright Star Basin, Expresso, Fast Track, Inn Bound, Southern Crossing, Spur Line, and Sunset Strip. Southface beginner trails are Dream Weaver, Sun Dog, and Suncatcher. Solitude beginner trails are Coleman Brook, Day Break, Jack-a-Lope, Promenade, Rising Star, Roundhouse Run, Sweet Solitude, and Village Run. Lift tickets begin at $100 for adults (19-64), $88 for young adults (13-18) and seniors (65-69), and $76 for juniors and super seniors (69+), Monday through Friday, excluding holidays. Weekend, non-holiday tickets cost $110 for adults, $97 for young adults and seniors, and $84 for juniors and super seniors. Holiday tickets are $115 for adults, $101 for young adults and seniors, and $87 for juniors and super seniors. Holiday periods for the 2017/18 season include December 23 to January 1, January 13 to 15, and February 17 and 23. Discounts and deals are offered for residents of Vermont and New Hampshire, for the military, and for college students. Okemo’s Take 60 program provides a return-visit coupon if you are unsatisfied with the snow within your first hour at the resort. Coleman Brick Tavern: An American tavern with an extensive and award-winning wine list with more than 700 selections at the Jackson Gore Village, Coleman Brick Tavern also has a lobby bar with creative martinis and a wide selection of liquor. Sample dishes like steamed Maine bouchet mussels, buckwheat gnocchi, and a farmhouse burger with 10 ounces of Vermont prime beef. Epic: At the base of the Solitude lift, visit Epic with ingredients from local Vermont farmers and artisans, in creative dishes by Executive Sous Chef Mark Wiegland. If you don’t want to take a break from the slopes to take in the views, you can grab and go at the deli or the Starbucks. Tom’s Loft Tavern: Off-the-mountain, Tom’s is one of the best spots for apres ski in Vermont. The smoked meat, juke-box music, and game room for kids, are super popular in Ludlow. Rental equipment can be found at the Clock Tower Rental Shop and the Jackson Gore Rental Shop. Ski equipment from Volkl, Elan, and Nordica and snowboard equipment from Burton, Salomon Snowblades, Atomic Telemark Skis and Giro can be rented, as well as performance gear. Kids’ options for lessons include groups (ages 7+), private (ages 2+), and “Penguin Playground” daycare. Season-long programs are “Little Dippers” (age 3), “Snow Stars” (ages 4-6), and “Mountain Explorers” (ages 7-14). Advanced kids can participate in the “AmplitudePLUS” program, where they’ll master advanced groomers to bumps, terrain parks, the Superpipe, glades, and boundary-to-boundary trees. Even more advanced skiers ages 8-19 should check out the competition and racing programs. Adults can take group or private lessons. Women can partake in special five-day, three-day, or one-day “Sunday Fun-Day” programs. Indoor Golf Training Center: Located at the Nordic Center is a golf learning facility featuring a 700-foot putting green, swing stations, and a computerized virtual golfing simulator. Group and private lessons are offered as well as season passes to the center. Mountain Coaster: Okemo’s mountain coaster is open year-round and offers thrills from the five-minute 1,600 foot climb up to Jackson Gore Peak to the 375 vertical-foot drop for 3,100 feet, at speeds of up to 25 miles per hour. Rides start at $15 for the 2017/18 season. Snowtubing: There are multiple lanes at the snowtubing park off of the magic carpet lift in the courtyard at Jackson Gore. One-hour sessions are $15 for ages 7 and older and $10 for kids under 7 for the 2017/18 season. Ice House: Okemo has a full-size regulation hockey and ice-skating rink. Skate rentals are available. Lodging options at Okemo include hotels, condominiums, B&Bs, country inns, lodges, and rental homes. Depending on how close you want to be to the slopes, there are ski-in, ski-out facilities, walkable locations, places reachable by shuttle access, and accommodations in the valley. We named Jackson Gore Inn the best ski-in, ski-out hotel in Vermont as it is located just steps from the Coleman Brook Express Quad.